The Belgian Army had approximately 200 combat vehicles at the time of the German invasion in May 1940. They were not organized into units of their own, but were spread out in various infantry and cavalry divisions for use as support weapons. The Belgian Army viewed their combat vehicles as defensive weapons. The practice of spreading out combat vehicles in so called "penny packets" (also used in the French Army at the same time) left them at a disadvantage against the German invaders, who concentrated their armour into organic units that could act on their own and that outnumbered the opposing vehicles even if units of the same size faced off against each other. The T15 was a version of the British "Commercial Light Tank Vickers Carden-Loyd 4 ton". The main armament was a 47 mm anti-tank gun instead of a machine gun. They were regarded as tank destroyers; except the first model (B1) all had fully rotating turrets. This Tank Destroyer is a nice first vehicle for Belgium. 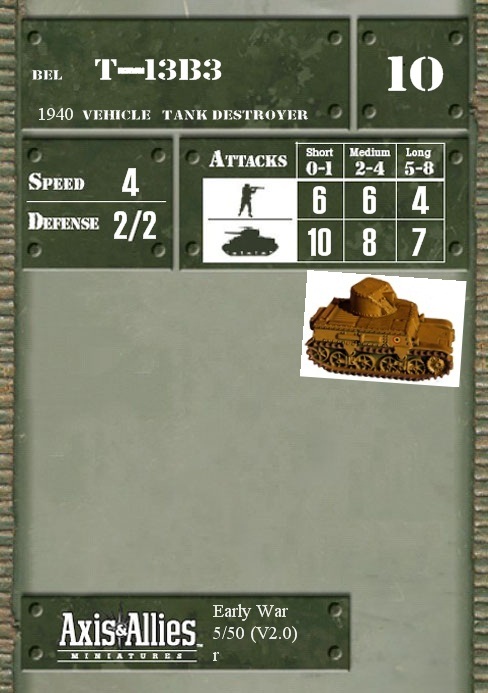 The invading German armour will need to be careful when approaching the T-13B3 as it has very good anti-vehicle attack values for 1940. Its anti-infantry values are a little below average but are more than capable of holding back enemy infantry but it is far from a sure thing. It's defence 2/2 is easily destroyed so you want to keep it under cover. The cost 10, is reasonable and the speed 4, is average and gives you room to manoeuvre.